Is the wind beginning to shift against the big bang? The prestigious Proceedings of the National Academy of Sciences has published a revolutionary paper1 which (probably unwittingly) gives powerful support to the basic principles of Dr Russell Humphreys’ creationist cosmology. Humphreys’ proposal, which sought to solve the ‘light-travel-time’ problem, is set out in the popular-level (with technical appendix) book Starlight and Time.2 Because it starts with different assumptions from the standard ‘big bang’ notion, applying the same mathematical ‘machinery’ provides startlingly different conclusions. Now the establishment seems prepared to consider that the foundational beliefs of big bang thinking may be radically wrong. The standard assumption upon which big bang thinking is built (an assumption is a belief for which there is no proof either way) is that the universe does not have a center or an edge. Smoller and Temple’s paper assumes the opposite, just as does Humphreys in Starlight and Time. And just as Humphreys’ model has the universe expanding out of a white hole (a black hole running in reverse) so too does their paper! In their model, the event horizon (the hypothetical boundary around a black or white hole at which time slows down dramatically) is still ‘out there’, whereas Humphreys has it touching the earth during Creation Week. So the Smoller-Temple paper is not concerned with time dilation. The big bang’s horizon problem. 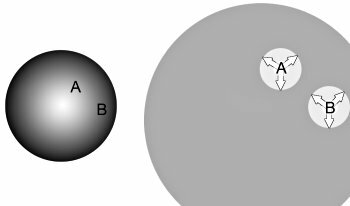 Early in the alleged big bang, points A and B start out with different temperatures. Today, points A and B have the same temperature, yet there has not been enough time for them to exchange light (heat radiation) (arrows) to equalize temperature. The purpose is, of course, not any sort of personal critique, but a highlighting of the principles involved. Science keeps on changing. If we marry our interpretation of God’s Word to today’s science, we will be out of step tomorrow; ‘but the word of the Lord stands forever’ (1 Peter 1:25). Smoller, J. and Temple, B., Shock-wave cosmology inside a black hole, Proceedings of the National Academy of Sciences of the USA 100(20):11216–11218, 30 September 2003. Return to text. Humphreys, D.R., Starlight and Time, Master Books, Green Forest, 1994. Return to text. Humphreys, D.R., Our galaxy is the centre of the universe, ‘quantized’ red shifts show, TJ 16(2):95–104, 2002. Return to text. Hartnett, J., personal communication, September 2003. Return to text. 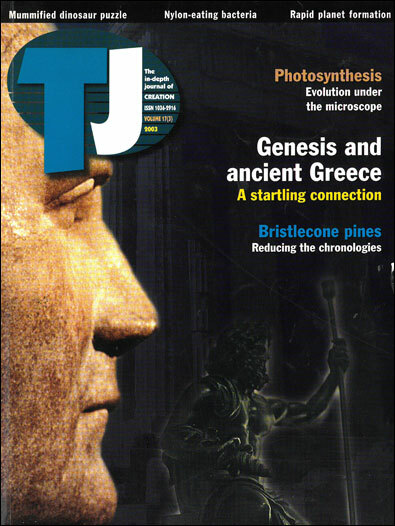 Newton, R., Light-travel time: a problem for the big bang, Creation 25(4):48–49, September–November 2003. Return to text. Humphreys has long seen his work as only the beginning, and Hartnett is one of those who has put forward modifications and refinements of the Humphreys model. Return to text. In a press release emailed September 2003. Return to text.